On the genetic side, it's possible some children are more susceptible (more likely) than others to develop this problem. But it takes one or more "triggers" (environmental or external factors) to start the process. For example, there appears to be some relationship to nutrition. Children who are malnourished are more likely to develop this condition. There is some evidence that Perthes disease can develop after a single episode of ischemia (lack of blood to the area) no matter what the cause. But the risk goes up with repeated (multiple) episodes of blood loss. 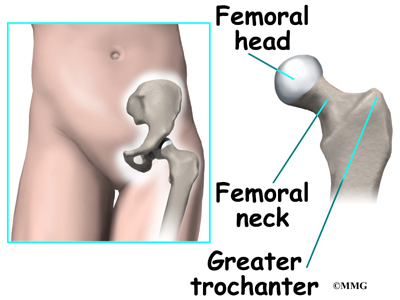 Whatever the true cause of ischemia (lack of blood to the area), the result is bone death (called necrosis) of the femoral head. Without a normal blood supply, the bone loses its strength and shape. The loss of bone density and softening of the head result in a misshapen head. 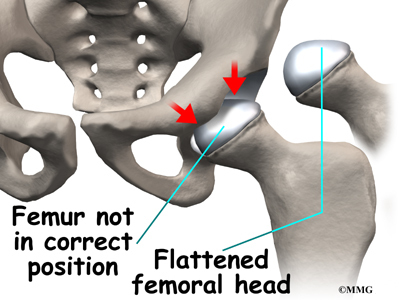 With the hip supporting the weight of the body, tiny microfractures in the soft, necrotic bone fail to heal. This is another reason why normal wear and tear results in deformity. 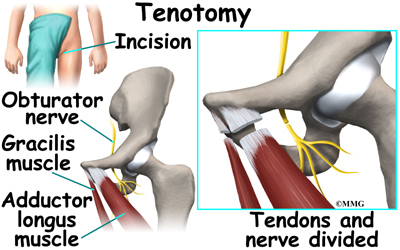 In planning treatment another test, called an arthrogram, may be required. 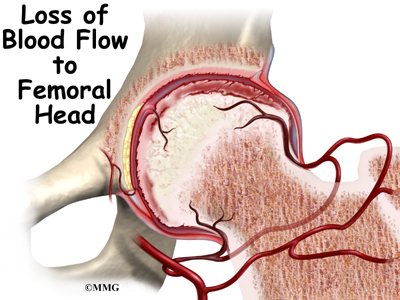 In this test, dye is injected into the hip joint to outline the cartilage surface of the joint. 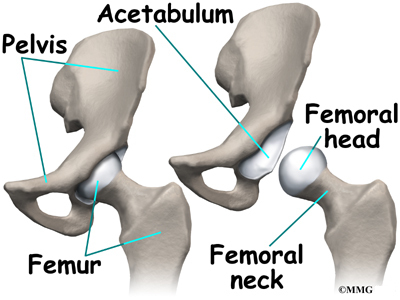 Much of the child's hip joint is made up of cartilage. Cartilage does not usually show up on X-rays. 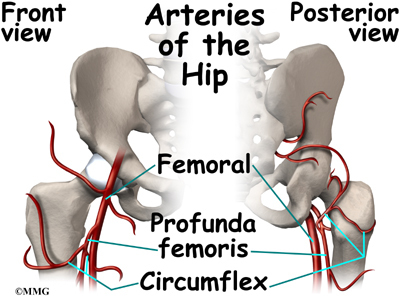 The dye is necessary to see what the hip will actually look like when the cartilage turns to bone. 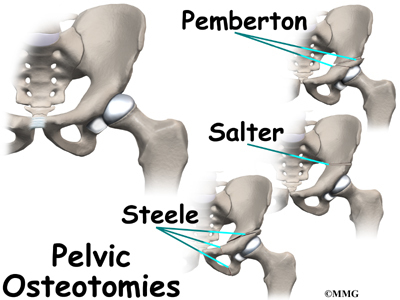 All treatment options for Perthes disease try to position and hold the hip in the acetabulum as much as possible. 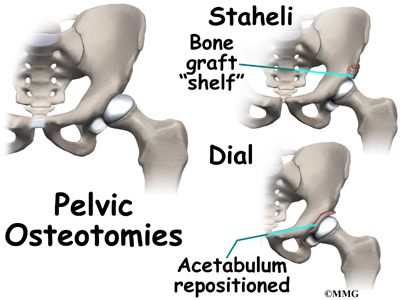 Giving the hip every opportunity to heal itself by limiting load on the joint may prevent the flattening of the femoral head and deformity that can develop. 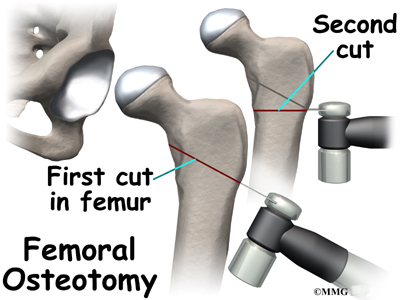 The only problem is -- it can take two to four years for the necrotic bone to get resorbed and replaced by new bone. And in some cases, new bone never forms. Instead, there is new granulation (healing) tissue, but that area doesn't harden into bone, it just forms cartilage. 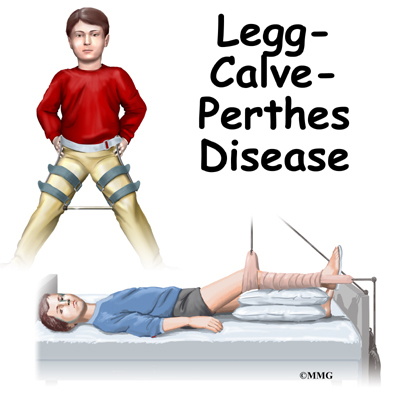 The majority of children who are treated for Perthes disease these days require only a program for maintaining a near-normal range of motion. 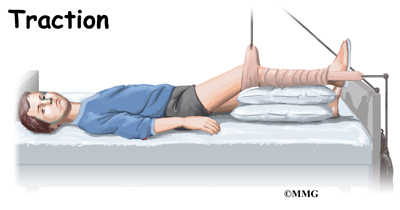 This may include nighttime splinting, home traction, and physical therapy.Your doctor will determine treatment based on your childâs age and a classification of the severity of the disease. The classification is determined by the X-ray findings. 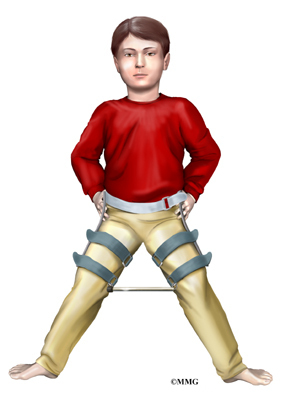 Bracing may be recommended if the child is six years old or younger. Surgery may be a best option for children who are seven or older and who have severe disease. Most of the studies support the idea that treatment of any kind just doesn't seem to make a difference for mild to moderate disease in younger children. Evidence from recent studies have changed our thinking about the usefulness of bracing. Bracing just doesn't seem to change the anatomy or alignment of the hip. There are some children who might benefit but they must be evaluated carefully and selected individually for this type of treatment.